This guide covers the basics of WHMCS; starting with ordering a licence, downloading the software, installing it and then what to do next. This page aims to provide a brief overview and will signpost you to the relevant sections in our documentation for full details on everything covered. 8 Where do I get help? 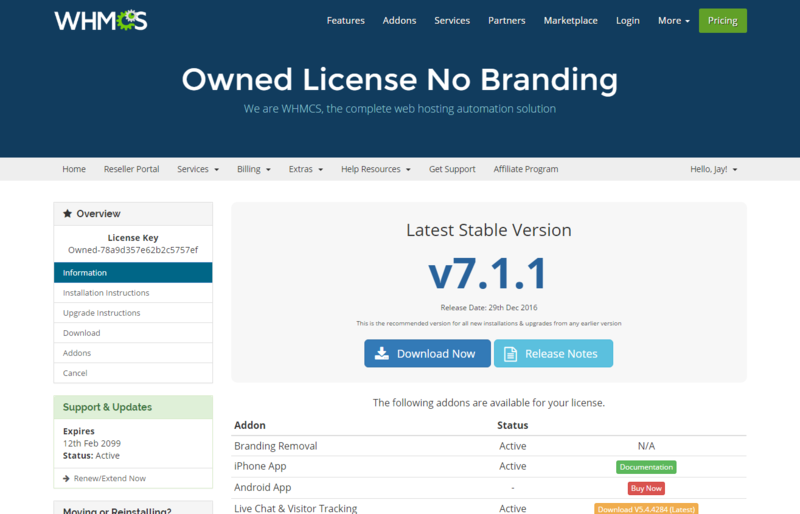 The very first thing to do is buy a licence for the WHMCS software. Simply click the Order Now link on any page of our website. We offer a range of licence options to suit all budgets but they all provide exactly the same software. You can switch between tiers at any time. We offer a number of great addons to increase the value of WHMCS; from a fully integrated live chat solution, mobile phone apps, to a full project management system. The option to buy some of these addons will be presented during the order process, for more information and to see the full range visit the Addons Page. Click the blue Download Now button to download the latest stable release. If you chose to purchase any addons which require extra files, their downloads will also appear here. Note: Not all our addons require extra files. Next the WHMCS software must be installed on your server. Please check with your server admin/hosting provider that your server meets the System Requirements. 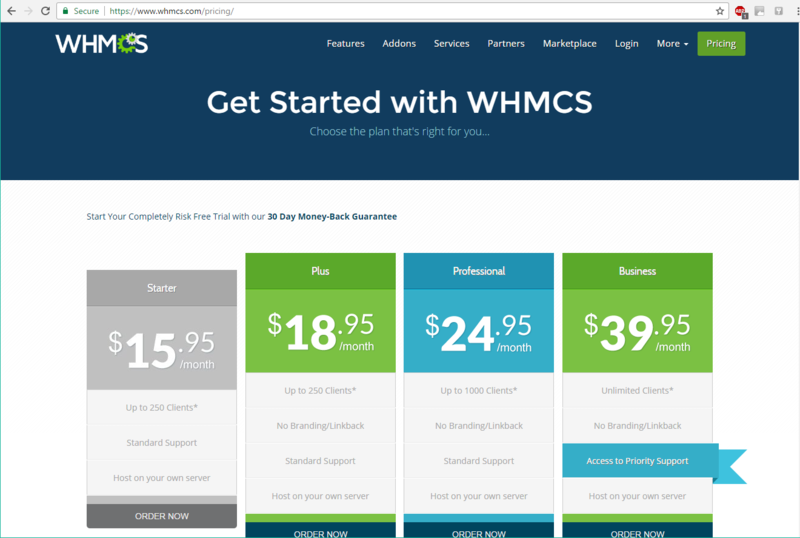 Installing WHMCS is as simple as installing many other web-based scripts (Wordpress, Joomla, phpBB etc). This is a very brief overview of the installation process. More detailed installation instructions are available. Create a new MySQL Database and assign a database user to it. Visit the installation script at /install/install.php and to run the installer process. When complete, delete the install folder from your web server and CHMOD the configuration.php file back to 644. The WHMCS software will contain some sensitive data, and whilst security is always our number one priority, it is sensible to take extra precautions to ensure your server and the software installed upon it is as secure as possible. To that end, we have some suggestions for further securing a WHMCS installation at Further Security Steps. Now the software is fully installed and secured you can start getting things configured. All the set up, configuration and day-to-day administration is done through the administration area. To login, visit the URL at which you installed the software, for example https://www.example.com/whmcs/admin using the username and password created during the installation process. 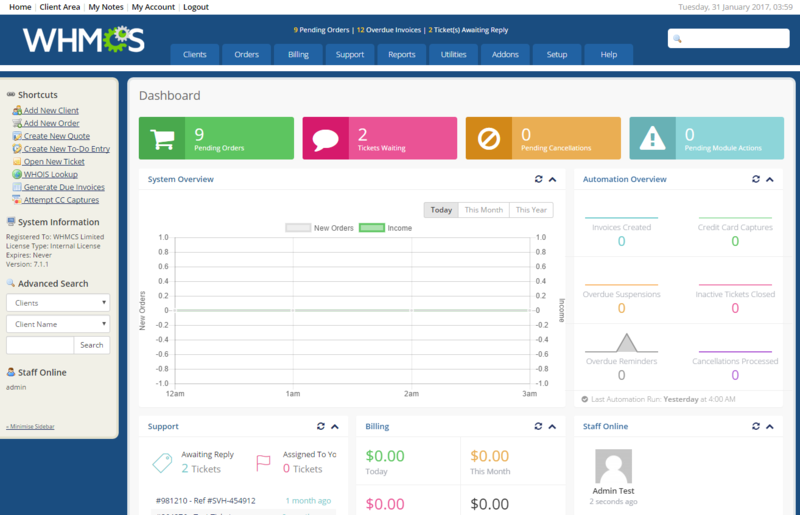 Upon login you will be see the Admin Summary page; this page provides an overview of all your company operations. At the top of the page are the Income statistics and the Attention Items - these are items requiring your action. The summary page is made up of "Widgets", each staff member can arrange them however they like simply by clicking and dragging. They can be closed by clicking the "-" icon and disabled entirely in the Administrator Role. You may already have some clients and wish to start managing them through WHMCS, they'll need to be imported. For instructions doing so, refer to the Importing Data page. Make sure you are up-to-date with all the latest fixes, updates and features introduced in your version of WHMCS by reading the Release Notes. We use a licensing system to ensure that only those who have paid for the software may use it. Learn more about this works and what you need to do if you wish to move your WHMCS installation on the Licensing page. 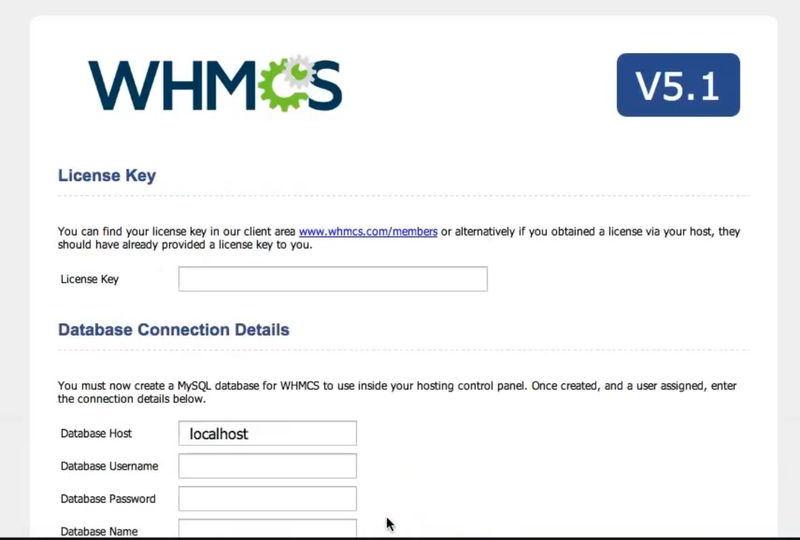 These flash video tutorials provide a visual step by step walk-through of all the common setup and configuration tasks you’ll need to perform when getting started with WHMCS. We recommend watching these before configuring the software. Our Community is home to a very active community of experienced WHMCS users that are always willing to help and discuss new ideas. These forums are primarily a place for discussion between customers and so you should not expect to receive a response from staff here. You should submit a support ticket when you are unable to find answers to your questions using any of the above resources. If you have a monthly license you are entitled to support at any time but if on an owned license, you may be required to renew your support and upgrades before help can be provided.